The MP 3300 Concrete Milling and Ceramic Tile Removal Attachment is a dual purpose tool for surface preparation. Concrete of asphalt substrate can milled to reduce and level raised areas or below grade areas can receive drainage grooves. Profile surface grinding is accomplished by the 700 lbs. of downforce from the grinder head keeping constant contact with the surface. In the floating mode the unit follows the contour of irregular surfaces. Conical carbide grinding bits milling and removal substrate material up to 1/4″ per pass. MP 3300 is an excellent tool to level curled concrete joints in slabs prior to diamond grind finish. The long lasting carbide bits remove concrete at substantially less cost for consumables than expensive diamond discs and plates. In most cases up to an 80% savings to flatten joints. Ceramic tile is removed by grinding and crushing into small pieces. The thinset and or underlayment leveling course can then be removed or milled to desired levels. The grinder head is offset to allow access closer to walls and obstacles. A propane tank bracket and conversion kit is available for most model skid steer units. The 9″ cut path and pivoting, self-leveling grinder head allows the MP 3300 to grind in hard to reach areas. An even weight distribution design of the cutters and host machine makes this unit accessible to roof top and load sensitive job sites. 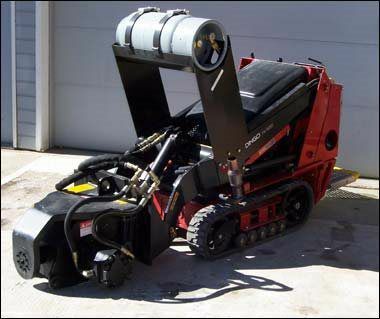 Less than 5 minute detachment of the MP 3300 from the host skid steer, and a single operator can attach diamond grinders, scarifiers, or floor scrapers to complete the concrete preparation. Road to bridge, asphalt to concrete transitions can be ground and milled by the MP 3300 attachment. Elevated areas due to freeze thaw conditions are reduced for a safe transition at a bridge approach. Freezing low areas that collect water can be drained to run off, away from traffic areas. Maintenance is easily accomplished with easy to reach grease points and carbide bit extractor tool. The grinder head can be lifted by the host machine and with proper safety support allows the operator to access the cutters for removal and replacement of new tips.